One of my favoite new items from the Occasions catalog is the water color pencils and this wonderful new Inside the Lines Designer Series Paper, a Sale-A-Bration free selection with a $50 order. This was one of the cards we made during OnStage. 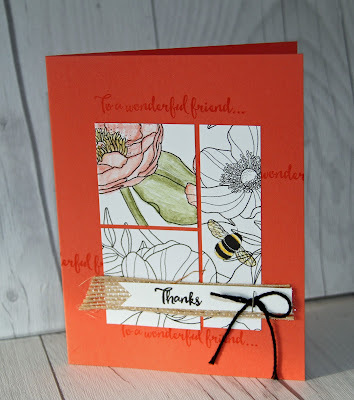 We cut the Designer Paper into pieces and then colored only parts of the flower image and the bumble bee. I'm in love with that big plump bumble bee! This used dry watercolor Pencils. I can't wait to try this same technique with the acquapainters. Take a look at the video below to see different techniques with these new watercolor pencils. Here's a video showing more ideas for using the Inside the Lines Designer Series Paper, which is one of the free Sale-A-Bration selections with a $50 order. In an earlier post, I showed tips on modifying your colored pencils case to more easily see the colors. If you missed it, take a look back at that post, now. Preview the new Occasions Catalog! Take a quick peek at some of the new items in the Occasions catalog and then download your free copy. This is reallyshort and is a fun way to see many of the new items from the catalog. Start the new year with more fun with friends crafting and stamping projects you'll be proud to send to family and friends. Refresh your stamping supplies with items from the 2017 Occasions Catalog, just released this week. A qualifying $50 order earns you a free selection from the Sale-A-Bration Brochure. Sign up as a hobby demonstrator for $99 and get $125 in merchandise you select plus an additional 2 free stamp sets. As a demonstrator, your future purchases earn discounts of 20 to 25%. Or turn your hobby into a business and earn extra money based on your sales and recruiting. Contact me today and we'll discuss your starter kit order based on your crafting interests.